I clearly remember the first time I have seen someone cooking pumpkin, it was in 1979. 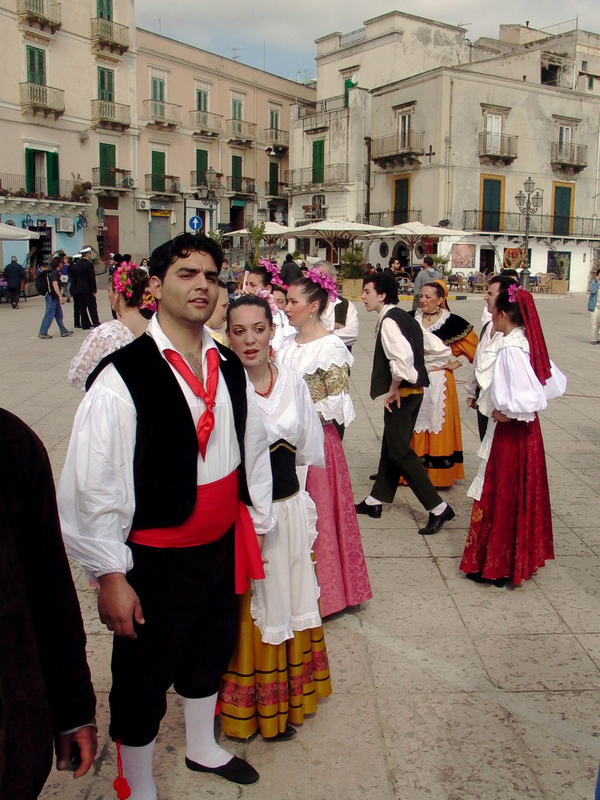 I was with my family visiting friends during a summer holiday on the magnificent Lipari island, off the coast of Sicily. A teenager girl, only a little older than myself, was frying those brilliant orange slices in olive oil. We ate no pumpkin in Umbria then, but Sicilians use the sweet “delica” pumpkin in all sort of fabulous dishes, including candy and preserves. I did not get to try those beauties, but I guess she was making “zucca in agrodolce” (sweet and sour pumpkin) whereby the slices would have been finished in a sauce of vinegar, sugar, mint and garlic to serve – later in the day – as a side dish. In contrast, I don’t remember when “zucca” arrived in Umbria. In our small rural region people used to be opposed to novelty, but it must have happened around the mid ’80s. Now we have pumpkin by the truckloads during the whole winter. We also have a clumsy version of Halloween when the kids don’t know what to do except dressing up and terrorize the bewildered village elders who have no idea what’s this new Carnival about. Only a few of them know you are supposed to give them candy when they turn up screaming at your door. Of course we all think that pumpkin is for eating, not for those quaint porch lanterns. We are Italian after all, we have a fixation with food. First of all organize your worktop so to have ample space to work. Please read my notes about making proper lasagna. Stew pumpkin and onion in 2 tablespoon olive oil until soft and falling apart. Add 1/4 teaspoon salt, stir and transfer into the bowl of a food processor together with the ricotta. Process until thick and creamy. Remove casing from sausages and saute in a heavy pan over medium-high heat until cooked through, breaking up large pieces with a fork, about 10 minutes. Add fennel seeds, stir for one minute, then deglaze with 1/2 cup white wine. Switch off and set aside. Umbrian fresh sausages are liberally seasoned with black pepper and garlic. If you can’t find a similar sausage, add 2 cloves of finely minced garlic and a good sprinkle of black pepper just before deglazing with wine. Preheat the oven at 200 °C (400 °F). Butter generously a 40 x 30 cm (16 x 12 inch) roasting pan. To blanch the pasta sheets, place a shallow pan, half full with water on the heat and bring to the boil. Using a slotted spoon, deep one or two lasagna sheets at the time in the boiling water until just soft, approx 30 sec, strain and place in one single layer in the buttered tin. Once the bottom of the tin is covered by lasagna sheets, pour 1/4 of the pumpkin/ricotta mixture over the pasta sheets and spread it in a thin layer. 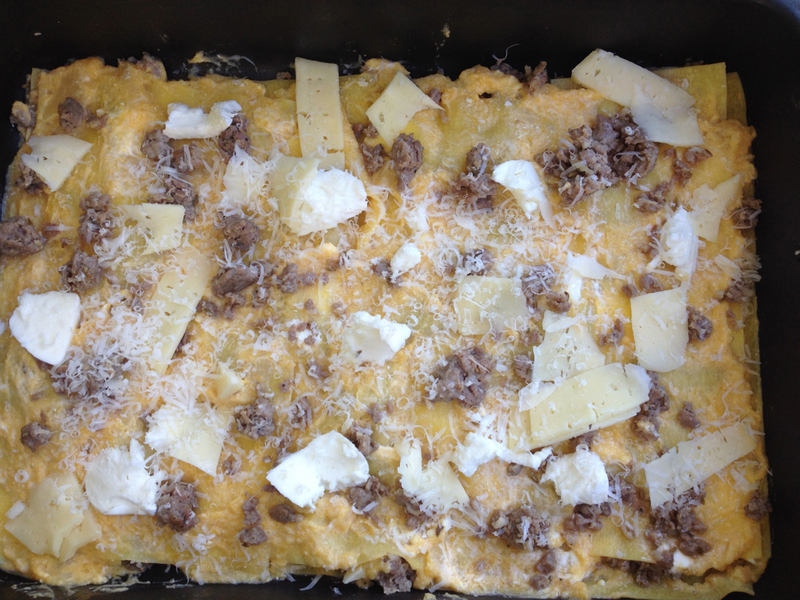 Top with 1/3 of the sliced cheese, 1/3 of the cooked sausage and 2 tablespoon of grated Parmesan. Repeat two more times using all the sausage and sliced cheese and 2/4 of the pumpkin mixture reserving 1/4 for the top layer. Top with one last layer of pasta sheets, cover thinly with the rest of the pumpkin mixture, sprinkle with 2-3 additional tablespoon of Parmesan and bake for 25 min or until bubbly and golden around the sides. building up the layers, a moderate amount of toppings is recommended! For a vegetarian version substitute sausage with smoked cheese, gorgonzola or saute porcini mushrooms. PS. If you want to visit and carve one of those beautiful lanterns for me I will make you lunch. So delicious. I have a few pumpkins in the dispenda so may make this, but jut leaving out the sausages as I am vegetarian. I could learn to carve umpkins just to have lunch at your place. Francesca, I made it last night. Roasted the pumpkin slices in a tiny bit of olive oil and then deglazed with balsamic vinegar and a sprinkle of brown sugar and minced garlic. Today I will add some fresh mint leaves, smells lovely! Thanks for the recipe. I can’t wait to try it! Letizia’s, thanks for newsletter. Making my big Italian dinner for extended family a week from Friday. Wish me luck! I am sure it will be a wonderful meal Deb! I love pumpkin and most any winter squash…this recipe sounds wonderful! Printing it out…..thanks! Wow! Boy does this look good! I like the idea of substituting the mushrooms. I have vegetarian family who would love this for our Thanksgiving meal. lovely Veronica, make sure to use flavor mushrooms to offset the sweetness of the pumpkin! Che bontà! 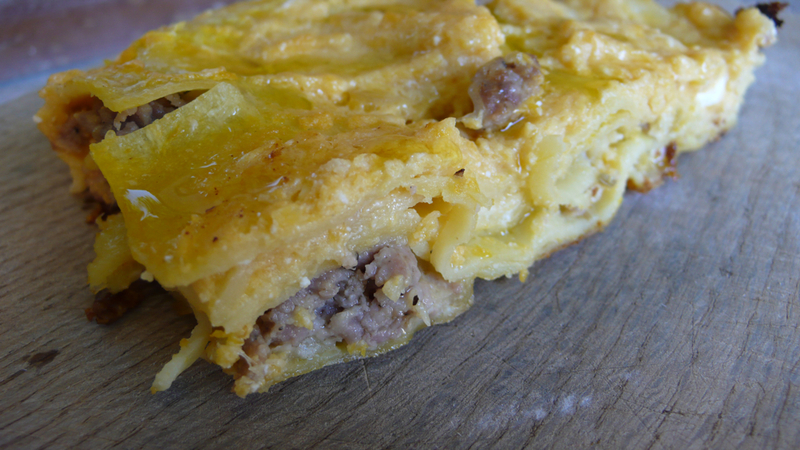 The combination of zucca, sausage and fennel seeds sounds exquisite … Have a nice week, Letizia! Letizia, I think this will be tomorrows supper for our family. What do you think of adding some mushrooms to the sausage?? I love the paring of the two in many other dishes, but I am not sure if the combination would overpower the pumpkin. Hi Jeff, a few porcini will not hurt, but indeed not a solid layer to avoid overpowering. Enjoy! I made this tonight after a long day capped off with grocery shopping – it was quite late bu the time the lasagna came out of the oven, but the aroma it gave off while cooking kept us from wanting to eat anything else! Quite delicious with butternut squash. So good to know you liked it Marta. Next time make a double batch as it freezes very well unbaked and makes a great meal after a long and busy day!